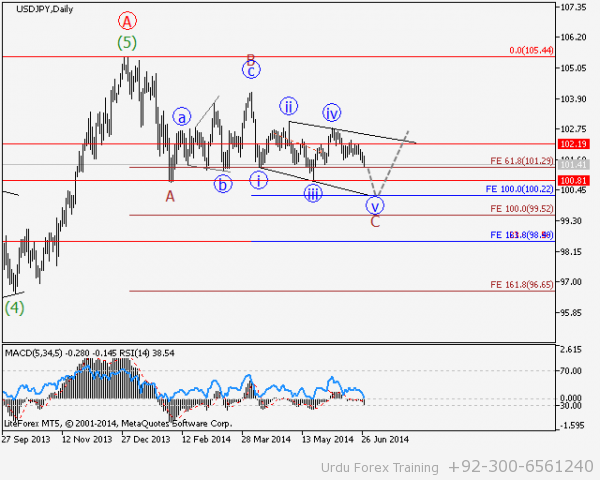 USD/JPY Wave analysis and forecast of 27.02 – 06.03: The pair is expected to grow. Estimated pivot point is at the level of 117.00. Our opinion: Buy the pair from corrections above a level of 117.00 with a target at 123.50. 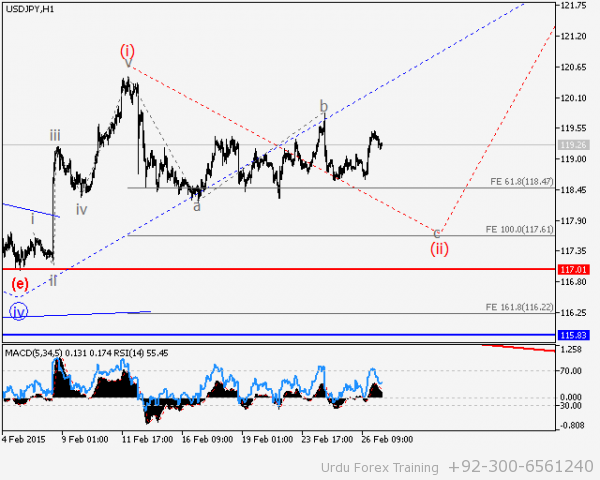 Sell the pair with the target of 115.00 – 114.00 in case the level 117.00 is broken down. Alternative scenario: Breakdown and consolidation below a level of 117.00 will allow the pair to continue declining to the levels 115.00 – 114.00. 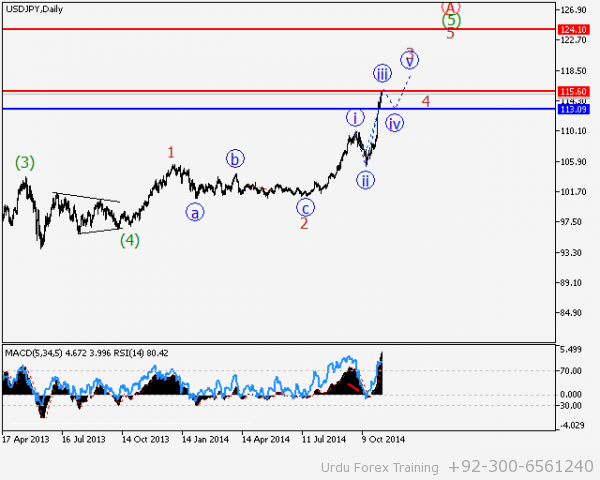 Analysis: The formation of the fifth wave under long-term bullish impetus is going on. Apparently, a counter-trend impetus in a form of first wave (i) has formed locally, and correction is developing within the wave (ii) that has not developed yet. If this assumption is correct and the price does not break the critical level 117.00, after correction the pair will continue to rise to the level of 123.50 within an upward trend. 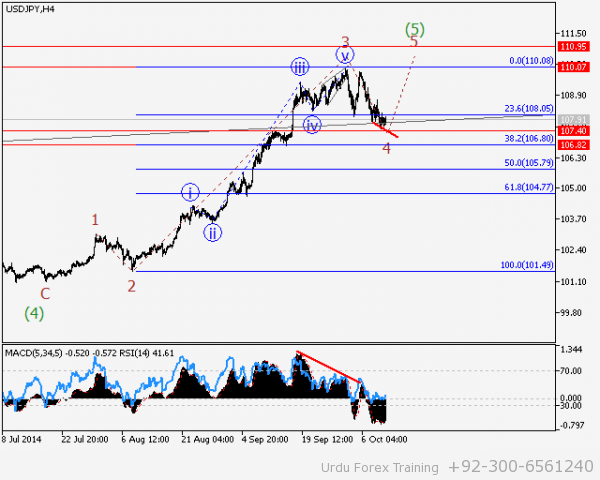 USD/JPY Wave analysis and forecast of 07.11 – 14.11: Uptrend dominates. The pair can undergo downward correction. Estimated pivot point is at the level of 115.60. Our opinion: In the short-term: sell the pair below the level of 115.60 with the target of 113.10. In the medium-term: wait for the completion of the local correction and buy the pair in case of confirmation signals with the targets of 117.0 – 118.0. Alternative scenario: Breakout and consolidation of the price above the level of 115.60 will enable the pair to continue growth up to the levels of 117.0 – 118.0. Analysis: The pair continues to rise and it is likely that only the third wave in the fifth wave of the senior level is being developed. Locally, the formation of the momentum in the third wave of the junior level is nearing completion, and if this assumption is correct, the pair can undergo downward correction as the fourth wave and then continue to grow up to the levels of 117.0 – 118.0. 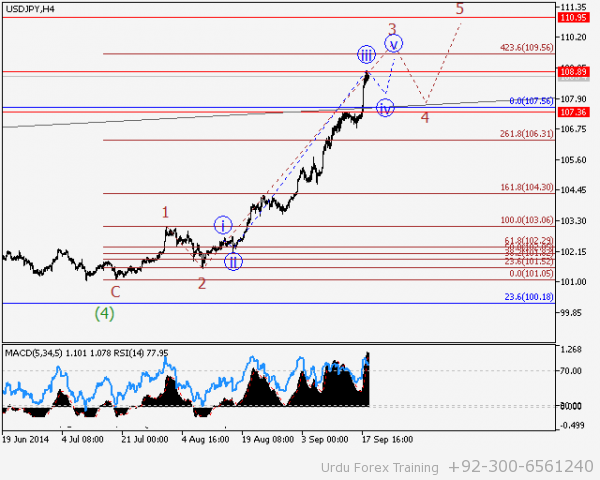 USD/JPY Wave analysis and forecast of 07.10 – 17.10: Uptrend dominates. Correction is nearing completion. Estimated pivot point is at the level of 107.40. Our opinion: Buy the pair from correction above the level of 107.40 with the target of 110.00 – 111.00. Alternative scenario: Breakout and consolidation of the price below the level of 107.40 will enable the pair to continue the decline to the level of 106.80. Analysis: Presumably, the formation of the “bearish” correction as the fourth wave of the senior level 4 of (5), which has a shape of a plane (with slightly extended wave c of 4, within which a wedge is likely to be formed), is nearing completion. If this assumption is correct, it is expected that the pair will reverse and start to grow to the level of 111.0 in the final fifth wave 5 of (5). 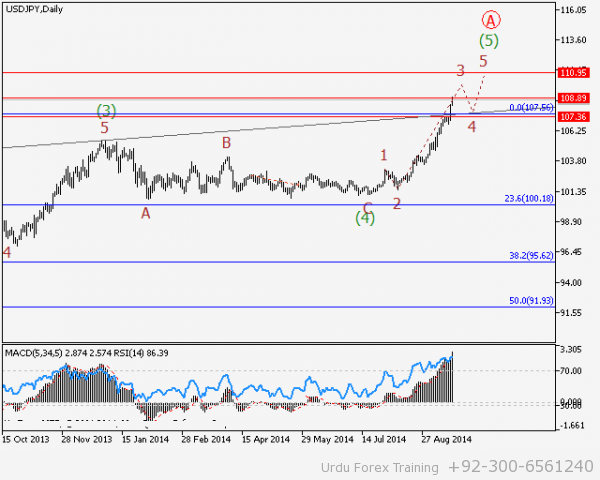 USD/JPY Wave analysis and forecast of 03.10 – 10.10: Uptrend continues. Estimated pivot point is at the level of 107.98. Our opinion: Buy the pair from correction above the level of 107.98 with the target of 110.00 – 111.00. Alternative scenario: Breakout and consolidation of the price below the level of 107.98 will enable the pair to continue the decline to the level of 106.80. Analysis: Presumably, the formation of the fifth wave of the “bullish” impetus continues on the weekly timeframe. Locally, the fourth wave 4 of (5) is probably completed, and the final fifth wave started to rise. If this assumption is correct and the price does not break down the critical level of 107.98, the logical conclusion is that the pair will continue its growth to the level of 110 .00 – 111.00. In case the critical level is broken, the correction will continue to decline to the level of 106.80. 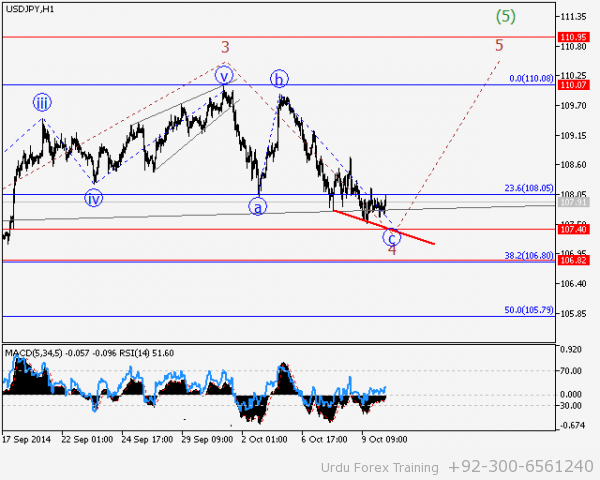 USD/JPY Wave analysis and forecast of 19.09 – 26.09: The pair is likely to grow. Estimated pivot point is at the level of 107.35. 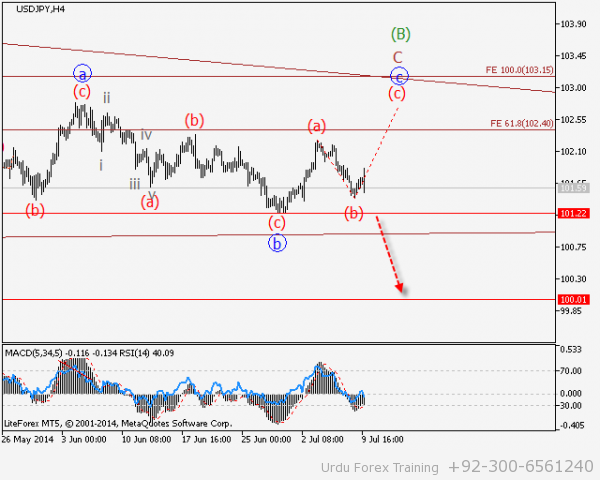 Our opinion: Buy the pair from correction above the level of 107.35 with the target of 109.50 – 110.00. Alternative scenario: Breakout and consolidation of the price below the level of 107.35 will enable the pair to continue the decline to the levels of 107.0 – 106.50 as part of correction. Analysis: Presumably, the formation of the fifth wave of the “bullish” impetus continues on the weekly timeframe, with the target level of 110.0. 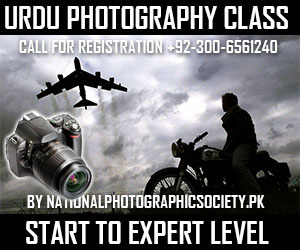 Locally it seems that the third wave of the junior level 3 of (5) has completed, within which extension has been formed. 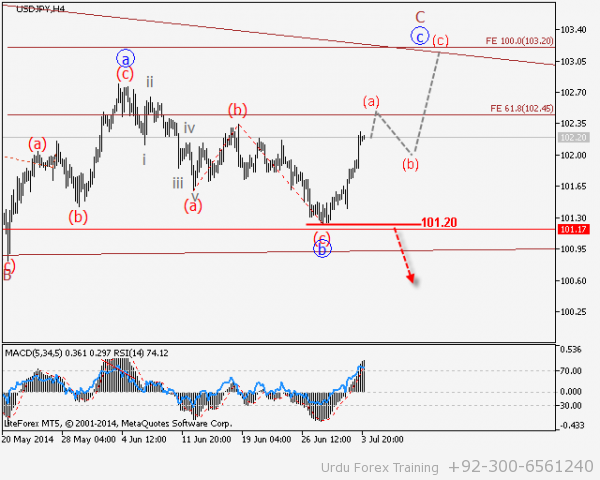 If this assumption is correct minor correction as the fourth wave will be formed and the pair will continue to rise up to the levels of 109.50 – 110.00. 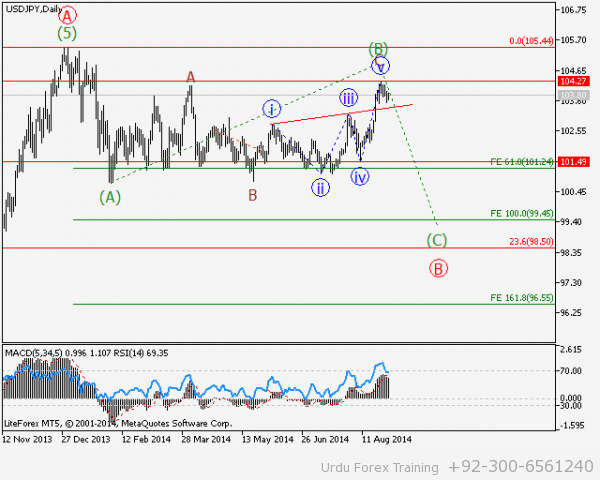 USD/JPY Wave analysis and forecast of 29.08 – 05.09: The pair is likely to decline. Estimated pivot point is at the level of 104.30. 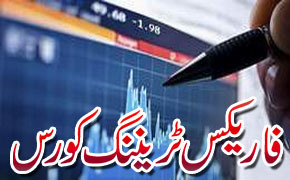 Our opinion: Sell the pair below the level of 104.30 with the target of 101.50 – 101.0. Alternative scenario: Breakout and consolidation above the level of 104.30 will make it possible for the price to continue the growth to the level of 105.0. Analysis: On the daily timeframe it is not excluded that the formation of the horizontal correction as the wave (B) is nearing completion. At the moment it is likely that the formation of the wave (C) is completed, within which, by all appearances, a diagonal triangle has formed. If this assumption is correct, it’s logical to expect soon a medium-term decline to the level of 99.45 in the wave (C). 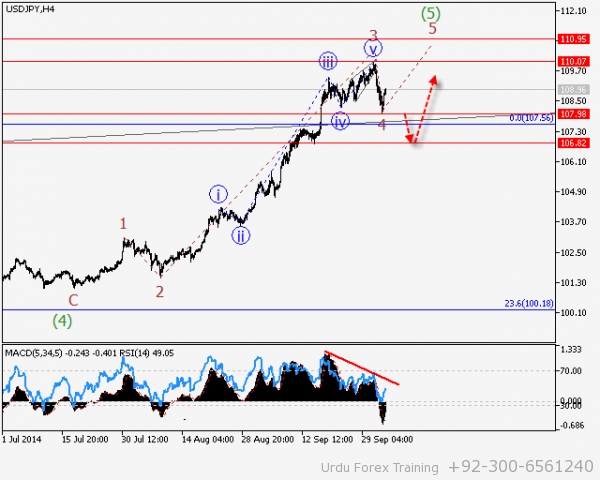 USD/JPY Wave analysis and forecast of 22.08 – 29.08: The pair is likely to decline. Estimated pivot point is at the level of 104.11. Our opinion: Wait till the reversal forms and sell the pair with the targets of 101.50 – 101.0 if it consolidates below the level of 104.11. Alternative scenario: Breakout and consolidation above the level of 104.11 will make it possible for the price to continue the growth to the level of 105.0. Analysis: On the daily timeframe it is not excluded that the formation of the horizontal correction in a form of the wave (B) is nearing completion. At the moment it is likely that the formation of the wave (C) is being completed, within which, by all appearances, a diagonal triangle has formed. If this assumption is correct, it’s logical to expect soon the reversal and the start of a medium-term decline to the level of 99.45 in the wave (C). This pair has continued its southward journey with price breaking below the resistance line at 1.3400. This level is a war zone between bulls and bears, so price will be making some attempts to get back above it. Should the initial resistance line get broken and price moves up, another resistance line at 1.3450 will act as a secondary hurdle for the bulls, so any break above 1.3450 will pose a serious threat to the bearish trend. 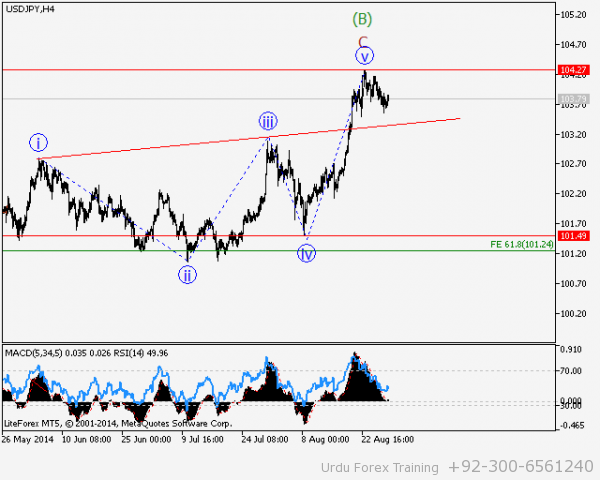 Meanwhile, the bearish trend seems likely to continue, pushing price towards the support lines at 1.3350 and 1.3300. 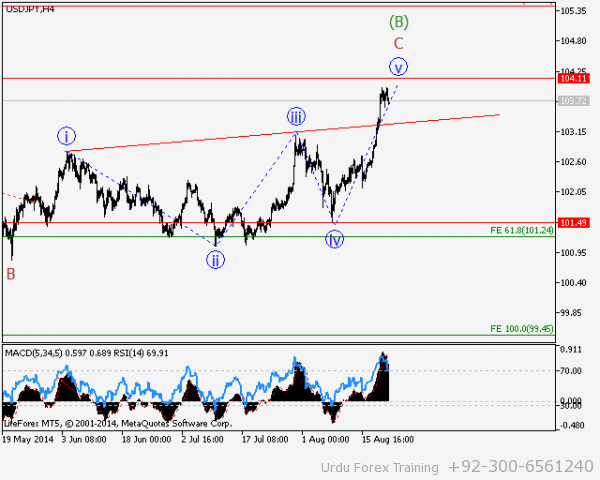 As forecast last week, USD/CHF was able to test the resistance level at 0.9100. This is an area where some bulls will want to take profits, as price ought to drop at least some way from there. For the bullish journey to continue, price needs to break that resistance level, going towards another resistance level at 0.9150. If this fails to occur, a near-term or medium-term bearish run is likely to begin. Cable dropped by about 120 pips this week, and the bearish outlook is currently strong – forming a clean Bearish Confirmation Pattern in the chart. 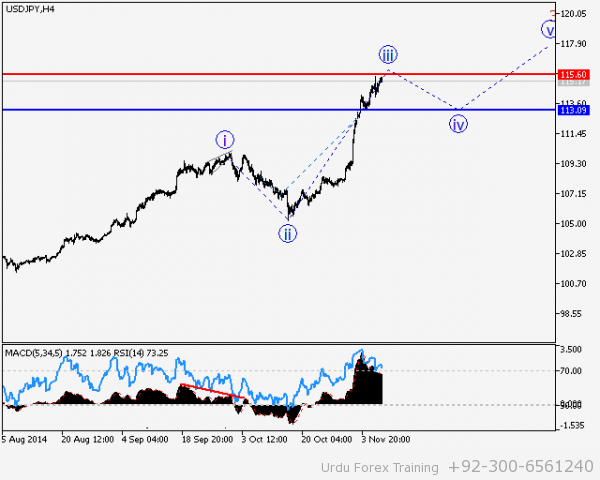 This means a high probability of price continuing even further downwards, testing the accumulation territories at 1.6850 and 1.6800 respectively – especially with the distribution territories at 1.6950 and 1.7000 acting as impediment to any rallies along the way. The Greenback is strong, so it is no wonder that USD/JPY rallied – especially in the face of Yen weakness. This market has tested the supply level at 103.00, which must be broken before any serious northward movement can continue. However, some deep pullbacks towards the demand levels at 102.50 and 102.00 are possible. EUR itself is not that strong but, as a result of exponential weakness in JPY, EUR/JPY has been able to reject its recent bearish bias, paving way for a new bullish signal. As long as price stays above the demand zone at 137.00, a bullish signal will make sense, and price could then even go up towards the supply zone at 138.00. 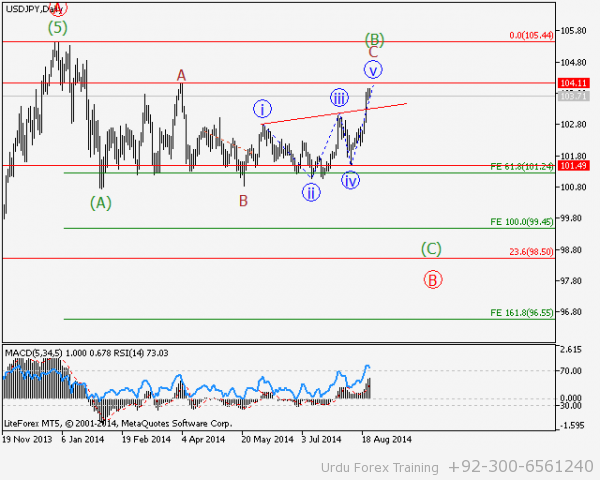 USD/JPY Wave analysis and forecast for 10.07 – 18.07: The pair is likely to grow. Estimated pivot point is at the level of 101.20. 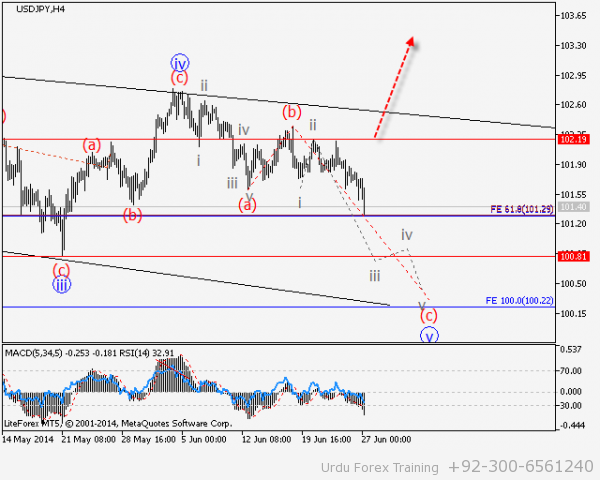 Our opinion: Sell the pair from correction above the level of 101.20 with the target 103.00. Alternative scenario: Breakout of the level of 101.20 will allow the price to continue the decline to the level of 100.50. Analysis: Within the daily timeframe it is not excluded that horizontal correction as the wave (B) is being formed, which may take a shape of a triangle. 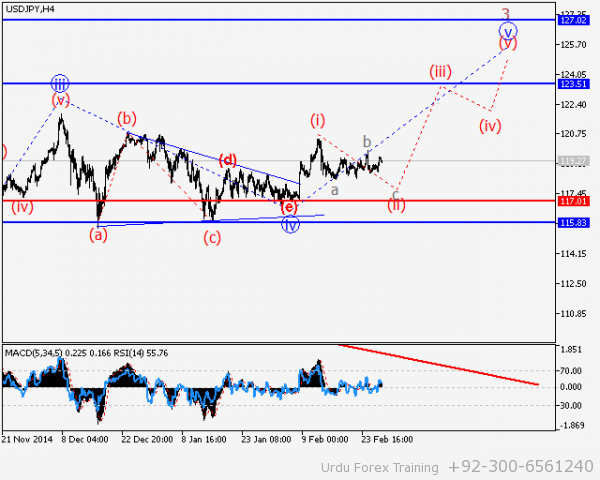 At the moment it is likely that the wave C, as the double zigzag, is being formed. Locally, it seems that the third wave of a zigzag (c) is being developed. If this assumption is correct the pair will continue to rise to the level of 103.00. Critical level for this scenario is 101.20. 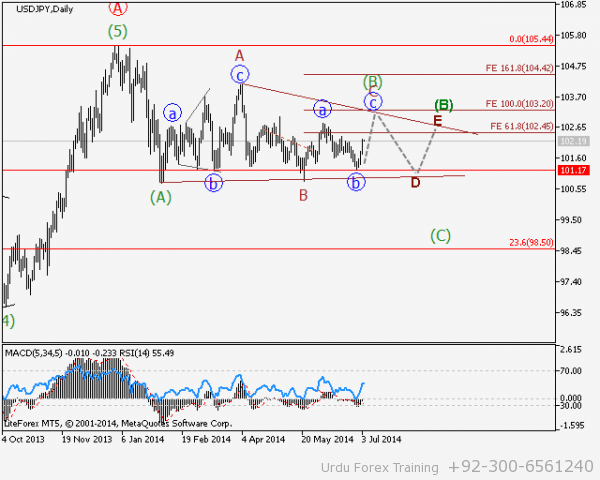 USD/JPY Wave analysis and forecast for 04.07 – 11.07: The pair is likely to grow. 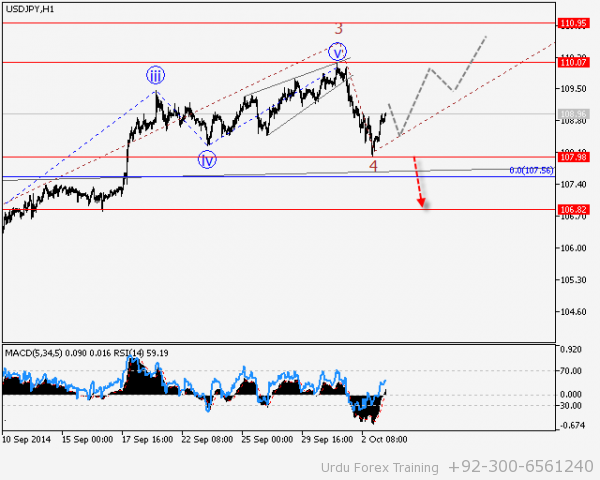 Our opinion: Sell the pair from correction above the level of 101.20 with the target of 103.20. Analysis: Within the daily timeframe it is not excluded that horizontal correction as the wave (B) is being formed, which may take a shape of a triangle. At the moment it is likely that the wave C, as the double zigzag, is being formed. Locally, the momentum as the first wave of a zigzag (a) is being developed. If this assumption is correct, after the completion of the local correction, the pair will continue to go up to the level of 103.20. Critical level for this scenario is 101.20. 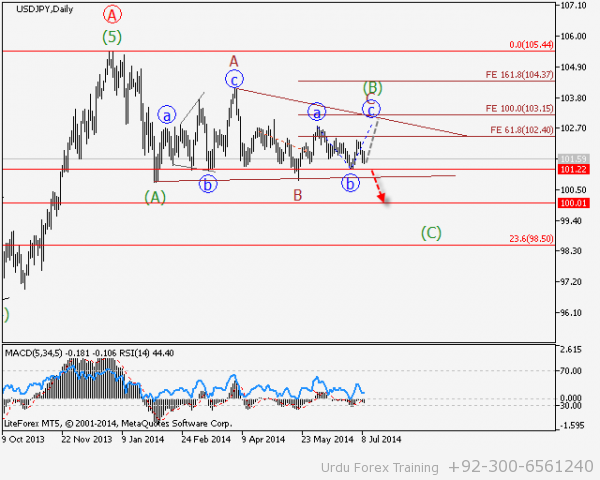 USD/JPY Wave analysis and forecast for 27.06 – 04.07: The pair is likely to decline. Estimated pivot point is at the level of 102.19. 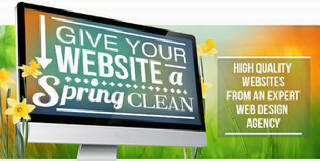 Our opinion: Sell the pair from correction below the level of 102.19 with the target 100.80 – 100.0. Alternative scenario: Violation of handle 102,19 will let a cuurence pair continue to grow up to handle 103,0. Analysis: A breakout of the level 102.19 will let the pair grow up to the level 103.0 Admittedly, the formation of the last ABC zigzag wave under daily timeframe is continuing. Locally, there is a formation of the fifth wave, under which the (a),(b),(c) zigzag is forming. If the statement is true, the pair will fall near the level 100.0. The level 102.19 is critical for this scenario.